Serial Peripheral Interface (SPI) is an interface bus commonly used to send data between microcontrollers and small peripherals such as shift registers, sensors, and SD cards. It uses separate clock and data lines, along with a select line to choose the device you wish to talk to. Binary is the numeral system of electronics and programming...so it must be important to learn. But, what is binary? How does it translate to other numeral systems like decimal? What's Wrong with Serial Ports? A common serial port, the kind with TX and RX lines, is called "asynchronous" (not synchronous) because there is no control over when data is sent or any guarantee that both sides are running at precisely the same rate. Since computers normally rely on everything being synchronized to a single “clock” (the main crystal attached to a computer that drives everything), this can be a problem when two systems with slightly different clocks try to communicate with each other. To work around this problem, asynchronous serial connections add extra start and stop bits to each byte help the receiver sync up to data as it arrives. Both sides must also agree on the transmission speed (such as 9600 bits per second) in advance. Slight differences in the transmission rate aren't a problem because the receiver re-syncs at the start of each byte. Asynchronous serial works just fine, but has a lot of overhead in both the extra start and stop bits sent with every byte, and the complex hardware required to send and receive data. And as you've probably noticed in your own projects, if both sides aren't set to the same speed, the received data will be garbage. 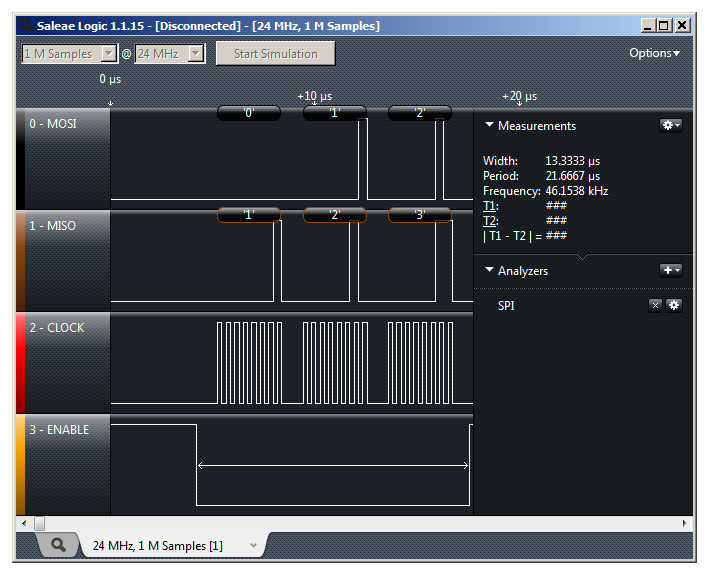 This is because the receiver is sampling the bits at very specific times (the arrows in the above diagram). If the receiver is looking at the wrong times, it will see the wrong bits. SPI works in a slightly different manner. It's a "synchronous" data bus, which means that it uses separate lines for data and a "clock" that keeps both sides in perfect sync. The clock is an oscillating signal that tells the receiver exactly when to sample the bits on the data line. This could be the rising (low to high) or falling (high to low) edge of the clock signal; the datasheet will specify which one to use. When the receiver detects that edge, it will immediately look at the data line to read the next bit (see the arrows in the below diagram). Because the clock is sent along with the data, specifying the speed isn't important, although devices will have a top speed at which they can operate (We'll discuss choosing the proper clock edge and speed in a bit). One reason that SPI is so popular is that the receiving hardware can be a simple shift register. This is a much simpler (and cheaper!) piece of hardware than the full-up UART (Universal Asynchronous Receiver / Transmitter) that asynchronous serial requires. You might be thinking to yourself, self, that sounds great for one-way communications, but how do you send data back in the opposite direction? Here's where things get slightly more complicated. 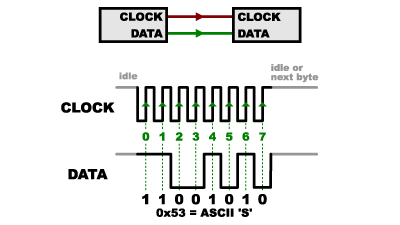 In SPI, only one side generates the clock signal (usually called CLK or SCK for Serial ClocK). The side that generates the clock is called the "master", and the other side is called the "slave". 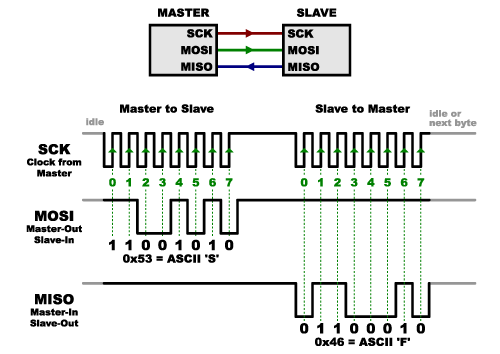 There is always only one master (which is almost always your microcontroller), but there can be multiple slaves (more on this in a bit). When data is sent from the master to a slave, it's sent on a data line called MOSI, for "Master Out / Slave In". If the slave needs to send a response back to the master, the master will continue to generate a prearranged number of clock cycles, and the slave will put the data onto a third data line called MISO, for "Master In / Slave Out". Note that SPI is "full duplex" (has separate send and receive lines), and, thus, in certain situations, you can transmit and receive data at the same time (for example, requesting a new sensor reading while retrieving the data from the previous one). Your device's datasheet will tell you if this is possible. There's one last line you should be aware of, called SS for Slave Select. This tells the slave that it should wake up and receive / send data and is also used when multiple slaves are present to select the one you'd like to talk to. 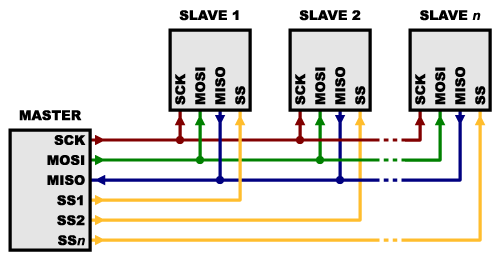 The SS line is normally held high, which disconnects the slave from the SPI bus. (This type of logic is known as “active low,” and you’ll often see used it for enable and reset lines.) Just before data is sent to the slave, the line is brought low, which activates the slave. When you're done using the slave, the line is made high again. In a shift register, this corresponds to the "latch" input, which transfers the received data to the output lines. In general, each slave will need a separate SS line. To talk to a particular slave, you'll make that slave's SS line low and keep the rest of them high (you don't want two slaves activated at the same time, or they may both try to talk on the same MISO line resulting in garbled data). 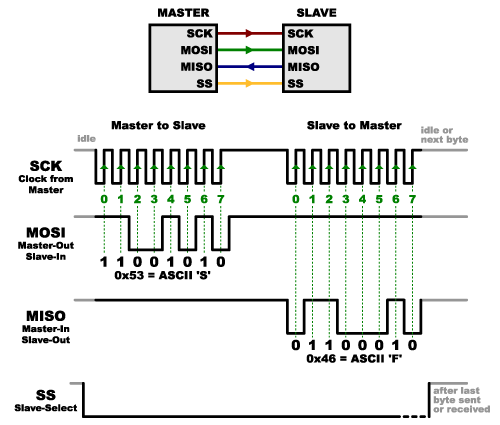 Lots of slaves will require lots of SS lines; if you're running low on outputs, there are binary decoder chips that can multiply your SS outputs. On the other hand, some parts prefer to be daisy-chained together, with the MISO (output) of one going to the MOSI (input) of the next. In this case, a single SS line goes to all the slaves. Once all the data is sent, the SS line is raised, which causes all the chips to be activated simultaneously. This is often used for daisy-chained shift registers and addressable LED drivers. Note that, for this layout, data overflows from one slave to the next, so to send data to any one slave, you'll need to transmit enough data to reach all of them. Also, keep in mind that the first piece of data you transmit will end up in the last slave. This type of layout is typically used in output-only situations, such as driving LEDs where you don't need to receive any data back. In these cases you can leave the master's MISO line disconnected. However, if data does need to be returned to the master, you can do this by closing the daisy-chain loop (blue wire in the above diagram). Note that if you do this, the return data from slave 1 will need to pass through all the slaves before getting back to the master, so be sure to send enough receive commands to get the data you need. Because of the high speed signals, SPI should only be used to send data over short distances (up to a few feet). If you need to send data further than that, lower the clock speed, and consider using specialized driver chips. If things aren't working the way you think they should, a logic analyzer is a very helpful tool. Smart analyzers like the Saleae USB Logic Analyzer can even decode the data bytes for a display or logging. It usually requires separate SS lines to each slave, which can be problematic if numerous slaves are needed. Check out the Wikipedia page on SPI, which includes lots of good information on SPI and other synchronous interfaces. This blog post presents a more correct way to set up an SPI network amongst your embedded devices, particularly for use with an Arduino microcontroller. A number of SparkFun products have SPI interfaces. For example, the Bar Graph Breakout kit has an easy-to-use SPI interface that you can use to turn any of 30 LEDs on or off. The AST CAN485 is a miniature Arduino in the compact form factor of the ProMini. In addition to all the usual features it has on-board CAN and RS485 ports enabling quick and easy interfacing to a multitude of industrial devices. Music Box Project based on the Dr. Who TARDIS. A guide for connecting the BEM280 sensor to a microcontroller, and for using the Sparkfun Arduino library.